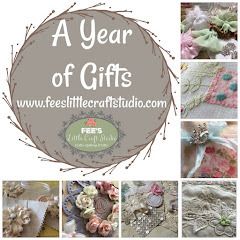 Fee's Little Craft Studio: It's Party Time ! Madeliene's Party was yesterday and a good time was had by all. Sam was exhausted as was Grandma. My house had looked like a bomb had hit it by the end but it was a lovely afternoon with friends and family. 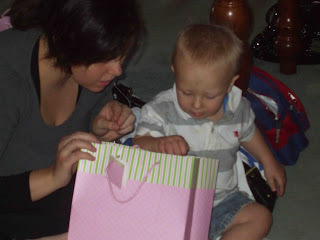 Thomas also had a great time and helped his mum unwrap the gifts. 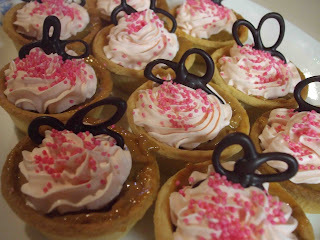 Caramel Tart with Pink Cream anyone? Or maybe a chocolate mousse tart? 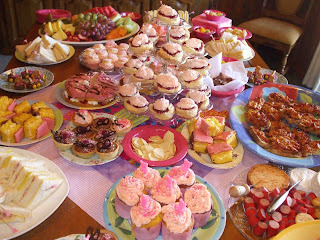 Most of the food had a pink theme - The Scones, Jam & Cream Tree complete with pink cream went well. 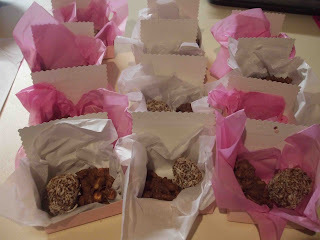 I made a gift box for all attendees which included a Bailey's Irish Cream Chocolate Truffle and Rocky Road. With a little Thankyou note. The project in the back garden is going well and Jeremy the builder is still toiling away this afternoon. 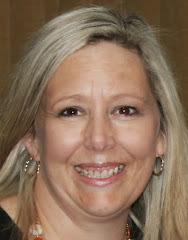 I have taken progress photo's. We took a little trip up the midlands today and lunched at a quaint little town called Ross. It has lots of little antique shops. We also found a little country market in a town called Kempton where I purchased something yummy for my home which we had trouble fitting in the car. I have taken photo's of that also and will post tomorrow. BTW I am getting close to my 50th post - Keep an eye out for another give away. I'm back to work tomorrow too :-( I hope you have a good day on your first day back. Party looked scrumptious! Looking forward to seeing what you bought at Kempton! Gosh Fiona, I can hear that table groaning with the weight of the food on it. All looks absolutely fabulous. I love the wee pic of Madeliene, the are so cute when the screw up their wee faces and what a cutie pie Thomas is. Do you cook for a living Fiona????? 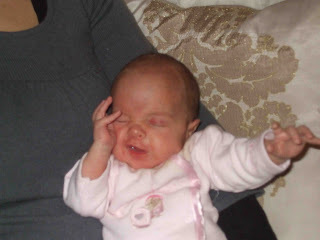 Hi Fiona, well you really went all out huh, and wee Maddie just looks so gorgeous, you lucky Grandma you! I am back at work tomorrow too! I think everyone else has used all the descriptive words I would have used here, yummy, fabulous, gorgeous, cutie. Looks like a wonderful day and what gorgeous grandkids you have. It's so nice to see little Maddie filling out and looking so healthy. 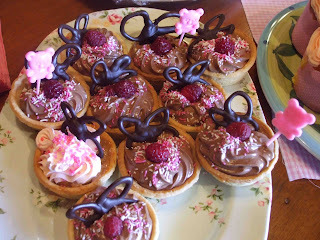 Um, would you happen to want to share the recipe for those scrumptious looking tarts? Glad your party went well. Maddie looks so gorgeous but a little bored with all the fuss! There are some serious calories weighing down that table, everting looks deliciously tempting. Look at all that food, delicious and beautiful! Looks like you had a great day. All that food. It looks great. And love the gift boxes as well. You have done so well. That food looks too good tob eat. Glad everybody enjoyed the party. Good luck back at work! Great to hear the party was a success Fiona!! The food looked incredible - all pink!! 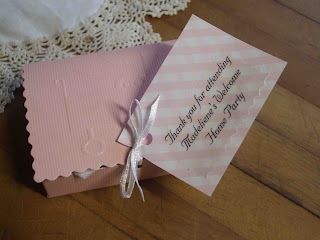 And, those cute little gift boxes - just gorgeous!! PS: I am really looking forward to seeing what you purchased from the market!! 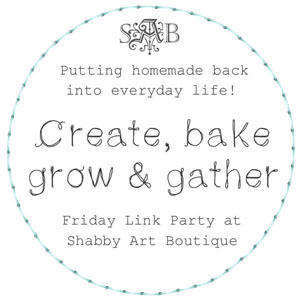 What a fabulous party, thanks for giving us a peep. Hope you had a smooth day back at work.